HERON module carrier with two 3.3V HERON module slots. Hi Speed (480Mbits/sec) USB 2.0 connection to a host PC. Can be used as a stand alone board for embedded systems. HUNT ENGINEERING Host API supported for Windows 2000 and XP and LINUX  FPGA and DSP loading, resetting and data exchange all performed with simple to use software interface. Multiple boards can be supported on same PC via board ID switch, but no inter-board connection is natively supported. FIFO connections between module slots and also between each module and USB. The HERON-BASE2 is a low cost but full featured HERON module carrier. It allows users of one or two HERON modules to connect their system to a PC via USB 2.0. This allows users of laptop as well as desktop computers easy plug and play access to HERON systems. The USB connection is supported via the HUNT ENGINEERING Host-API software. This allows software applications and tools on the Host PC to access the hardware using a consistent software interface without the need to understand or program the hardware or USB directly. An application written for the PCI based module carriers can easily be re-targeted to the HERON-BASE2 and vice versa. The USB connection offers access to the HERON system Reset, Heron Serial Bus and separate FIFO connections to each of the modules. 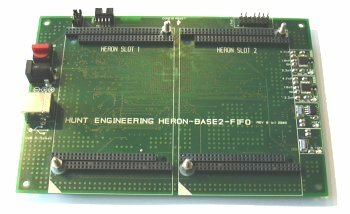 The Heron Serial Bus connection is used to load configuration programs into FPGA modules, and to send/receive configuration messages such as setting register values inside FPGA designs. HUNT ENGINEERING provide the FPGA loader tool that uses this interface to load Xilinx generated files into the FPGAs of FPGA based modules. The FIFO connections can be used to stream data to or from a module in the system. They are capable of up to 50Mbytes/second in each direction, but the Host PC, its USB controller and the operating system will all impose their own limits to this speed. Users of processor-based modules can use the HUNT ENGINEERING server/loader tool to download their programs to those processor modules via the FIFO connections. N.B. HERON-BASE2 is supplied with USB 2 certified cable and 20W mains PSU (needs IEC lead  not included).